This spacious 5 bedroom villa is in a great location, within a 10 minute walk from the beachfront and Pine Walk of Puerto Pollensa. You have a huge choice of shops and places to eat on your doorstep, and Pollensa Old Town is only a short drive away. Villa Ca’n Jota Paula (formerly known as Villa Paula Gotmar) has a large lawned garden and private, gated swimming pool. Pool heating, air conditioning/heating in all bedrooms and WiFi are included. The central position - the beach and restaurants of Puerto Pollensa are only a short walk from the villa! Villa Ca’n Jota Paula has a fantastic, spacious lawned garden, with plenty of space to sunbathe or for the children to run around. The brick BBQ is by the entrance with the table and chairs at the side of the house. 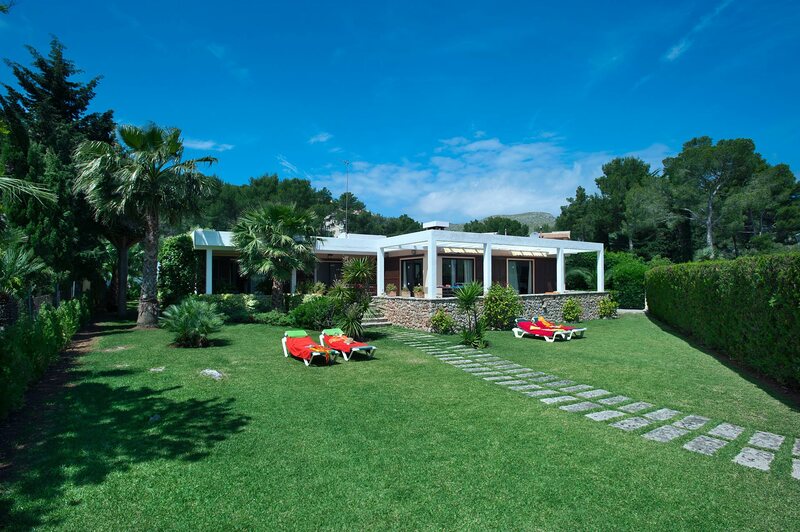 At the rear of the villa is the pool terrace which is gated from the main house for extra peace of mind. There is also ample space to sunbathe here. The villa has its own private parking bay with a path to the entrance. The spacious lounge and dining area are open plan, with patio doors onto the front terrace overlooking the lawn. There is comfortable seating, an ornamental fireplace and a table and chairs for 10. The neighbouring kitchen has a second, smaller breakfast table and patio doors onto the rear terrace. Villa Ca’n Jota Paula has 1 double bedroom with en suite bathroom and patio doors onto the front terrace. There is also a twin bedroom with en suite shower room (please note from 2019 this will be a double bedroom). The remaining 3 twin bedrooms share a separate bathroom and WC. This position of Villa Ca’n Jota Paula could not be better. The beachfront and restaurants along the Pine Walk of Puerto Pollensa (Puerto Pollenca) can be easily reached on foot within a few minutes. There is also a handy mini market at the end of the street where you can stock up on basic essentials. If that's not enough for you, the town of Pollensa (Pollenca) is within a short drive and is well worth a visit during your time in Majorca (Mallorca). For larger groups, Villa Pinos is next door. You'll be spoilt for choice for places to eat around the area. The contemporary seafront restaurants along the Pine Walk overlooking the beach are only a few minutes' walk away. For a more authentic Spanish dining experience, a trip into Pollensa Old Town is not to be missed. The main square and cobbled streets are lined with a huge choice of traditional tapas restaurants. There are also a number of shops as well as the local Sunday market in Pollensa which sells fresh produce for you to stock up on if you fancy an evening dining in. Puerto Pollensa Beach is right on your doorstep. Though keen beachgoers can venture to either Alcudia or Cala San Vicente where you'll find a choice of smaller, more relaxed sandy bays. All have nearby shops and places to eat for if you need a break from the heat. Children will love the Hidropark waterpark in Alcudia, around 20 minutes' drive south of Puerto Pollensa. Pollensa Old Town is definitely worth seeing during your stay. You can enjoy the superb scenery from the Calvari church, 365 steps up from the main square. Or, venture a little further afield to the marina or old town of Alcudia where you'll find a good choice of excellent restaurants and shops. The nearest golf course is Pollensa Golf, around 20 minutes away by car. Although the resort has a fairly laid back vibe, thrill seekers will find a choice of water sport facilities nearby. Windsurfing and water-skiing equipment, as well as sailboats, can be hired from the beach. Villa Ca\'n Jota Paula is not available to book for season as it is sold out. Take a look here at the Majorca villas that are currently on sale. Very good villa. Fantastic holiday, thanks.